Titan Poker mobile, play poker on the go! Play Titan Poker on the Go! Install Titan Poker mobile & login with your existing username & password! Now you can play poker anywhere, wherever you are. Insert your mobile number and get a link via SMS to access Titan Poker on your mobile. Thanks for registering. An SMS will be sent to your mobile phone shortly. Scan the QR Code to instantly load Titan Poker on your mobile. Fill in your email address and get a link via email to access Titan Poker on your mobile. Thanks for registering. An E-mail will be sent to you shortly. How do I start playing Titan Poker Mobile on my device? Use the various methods described on this page to start playing Titan Poker Mobile. What devices are supported by Titan Poker Mobile? 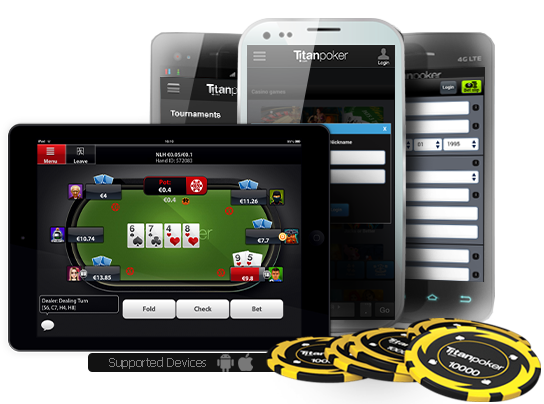 Titan Mobile Poker is available for iPhone®, iPad®, and Android™ devices. Is Titan Poker Mobile free? Yes, Titan Poker Mobile is free to install and use. Do I need an internet connection to use Titan Poker mobile? Titan Poker mobile requires you to have a data (internet) connection on your mobile device. You can play using a Wi-Fi or 3G connection. How do I create an account with Titan Poker Mobile? Once you have installed Titan Mobile Poker using the various methods described on this page, you will arrive to a login window where you will be asked to either register a new account or login with your current Titan Poker account details. If you already have an existing Titan Poker account, you will need to use that account to play from your mobile. You will not be allowed to create a new account. If I receive the message: "Please enable local storage to access Titan Poker Mobile and then press 'Retry'", what should I do? This message will appear if you have mobile private browsing enabled on your mobile. In order to access Titan Poker Mobile you will need to disable Private Mode by modifying your security settings. For IOS tap Settings > Safari > Private. For Android devices, swipe down from the top of any screen on your mobile using two fingers and tap Private Mode. Can I play poker for real money with Titan Poker Mobile? Yes, you can play poker for real money on the Titan Poker Mobile. Can I play Speed Poker with Titan Poker Mobile? Yes, you can play your favorite Speed Poker cash tables. Which languages can I play Titan Poker Mobile in? Titan Poker Mobile is available in English, German, Russian, French, Italian, and Dutch. Can I deposit and withdraw real money using Titan Poker Mobile? Yes, you can use the Web Cashier to make all deposits and withdrawals. Which payment methods are available for funding my Titan Poker account? You may use any of the secure Mobile payment methods we have listed on our payment options page. What are the differences between games available on Mobile Poker and those on the computer-based software? All real money games are available on Titan Poker Mobile Poker. When playing on your Mobile, you will be playing with the same pool of players as those using their computer. You can play on up to 4 tables simultaneously. To open or add a new table to the multi-table panel, press the “+” button in the top right corner of the active table view. Can I continue my gameplay if I switch between my computer and my mobile? To switch between devices, simply log out from one device and then log in using the other, however, you can only be logged into your Titan Poker account from one device at any given time. Please note, you will have to leave any cash tables at which you're sitting, and return to them after logging back in. If you're playing in a tournament, you will continue to be playing in that tournament when you switch devices. You may need to sit out a few hands while you log out from one device and log back in to another. The number of hands missed will depend on the time taken to switch devices and the speed of the tourney. How secure is it to play in Titan Poker Mobile? All communications between our software running on players' computers and our servers is encrypted. There are several security features built into the Mobile Poker App to help reduce risks. For example, you cannot save your password on your mobile device, so anyone who does not know the password cannot log into your account unauthorized. Please email support [at] titanpoker [dot] com as soon as possible from your registered Titan Poker email address, providing your name and username/nickname and any other relevant details you can supply. Will I experience lag or disconnections while playing on Titan Poker Mobile? The internet is a peer-to-peer network, which means that information flowing between your computer or mobile device and the game server must pass through several 'peer' machines (8 to 24 or more). These machines do not belong to Titan Poker or your internet service provider (ISP), but your connection depends on them. If any of these peer machines is having trouble, you may experience a temporary lag or disconnect. What happens if I answer a phone call while playing? Or click the Home button to send Mobile Poker to the background? Answering a phone call will send Titan Poker Mobile to the background. If you answered a phone call and wish to return to the game, you will need to manually restart Titan Poker Mobile. Any time the Titan Poker Mobile is sent to the background, this action will sit you out automatically at the tables. If you don't return to the application within a specified period of time, you will be disconnected from the server due to inactivity. How can I contact Mobile Support for comments/feedback? We really appreciate the time players put into providing us with feedback and suggestions to improve our products. Please send your feedback about Titan Poker Mobile to support [at] titanpoker [dot] com and we will be more than happy to review it. Android is an open source operating system based on Linux kernel that is designed primarily for use on touchscreen mobile devices, smartphones, and tablet computers. This open source code, released to the public by Google, is used by a large community of developers to write applications (apps) that are available for download for free or at a minimal cost from Google Play. Android is the world's most widely used smartphone platform. Android's share of the global smartphone market is about 80%, with Samsung products leading the pack. According to media reports, 48 billion apps had been installed from the Google Play store as of May 2013, and as of September 2013, 1 billion Android devices had been activated. A smart phone, by definition, is a mobile phone with more advanced computing and connectivity than a regular mobile phone. Smartphones typically include email functionality, media players, digital cameras and GPS navigation devices. And in the modern age of online gaming, poker apps are being developed for play on iPhone and Android devices. Poker software is currently available in both Android poker and iPhone poker versions, but as noted here, Android-operated smartphones currently rule the market. How exciting it must be to play with a Texas Hold'em Android application, enabling you to be mobile while you're at an exciting cash game or tournament. Hold'em Android apps promise to bring the excitement of download and flash poker software to your smartphone, no matter where you are. Play poker on the go!